Strongher are an international collective united by a desire to promote cycling for women, be that road, fixed gear or mountain bike, novice, pro or anywhere in between. With a diverse crew of riders such as Marian Vos and Manon Carpenter and myself on board, we want to share stories that inspire, lead rides and workshops that are fun and put on events that bring female cyclist together in a way that makes everyone feel comfortable and part of the gang! One event I’m particularly looking forward to, (actually that’s an understatement – I’m MASSIVELY excited about!!!) is Manon’s mountain bike weekender taking place this autumn at Afan where I’m a ride leader. We’ll get two days of riding the bike park, jumps and trails under Manon’s guidance, plus meals together and we’ll all stay at Afan Lodge, which is a really nice place. If you’d like to join us or find out more, click here. 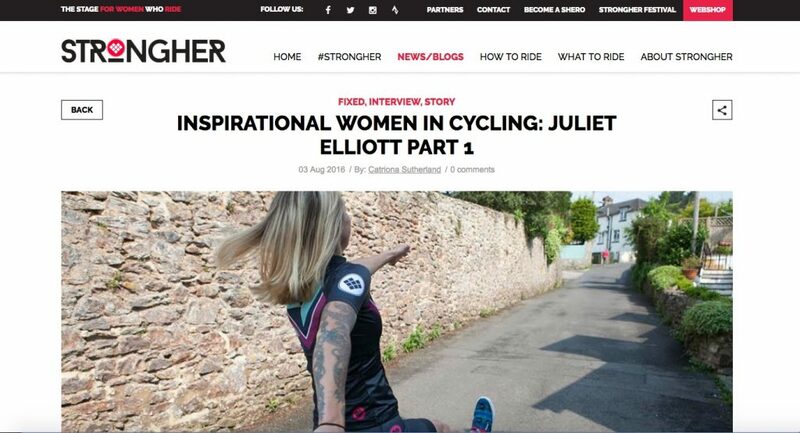 Alongside these events, the Strongher website is a great resource for women looking for advice, or you simply wishing to find out more about what makes cycling great. And you can find out all about the women already onboard or join up yourself. I’m delighted our team captain Marit Huisman found me sufficiently interesting to run a double interview with me over on the site – thanks Marit! Click here to read part one of the interview and here to read part two.